The Highlead GC20698-2-D FL2 is a twin needle long arm flatbed walking foot sewing machine with automatic thread trimmer and electronic needle position control. The long sewing machine arm allows up-to 635mm* clearance to the right of the needles, which is around 2.5 times bigger than a standard machine arm. It features a triple feeding action by way of: bottom feed, needle feed and walking foot top feed and is fitted with two large vertically mounted hooks & bases for use with medium to heavy weight materials. The machine is equipped with an automatic thread trimmer which is mounted under the needle plate for quick & accurate cutting of thread at the end of a sewing cycle. This saves considerable time when compared with manual cutting of threads using scissors etc. The thread trimmer is electronically controlled and uses electric impulse solenoids to move the cutting knives. The position of the needle is controlled by an electronic needle position motor & controller. This will automatically put the needles in an UP or DOWN position (selectable) at the end of a sewing cycle: reducing the need to use the manual hand wheel. 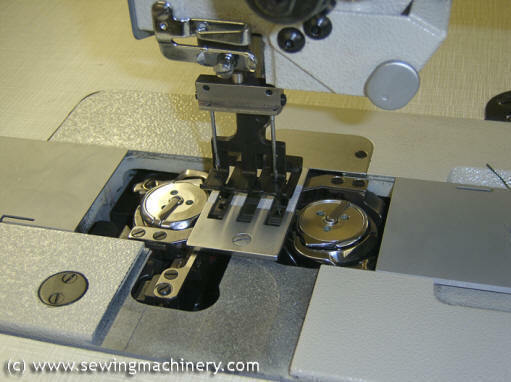 This function is of particular use on long arm machines as the hand wheel is further away from the sewing area. The Highlead GC20698-2-D FL2 is a feature packed machine and as well as compound feed (bottom feed, needle feed & walking foot) and automatic thread trimming, it comes as standard with programmable auto back-tack, auto reverse, knuckle quick reverse and built in stitch program module. It is fitted with the latest quiet & energy efficient electronically controlled heavy duty servo motor, which only runs when you are actually sewing; If you pause or stop: the motor stops immediately and is almost silent. The Highlead GC20698-2-D FL2 is a long arm, twin needle, needle feed, walking foot machine with UBT, for use on medium to heavy weight materials and is aimed at job applications where a standard arm sewing machine is not suitable. Large covers, upholstery panels, car trimmings, inflatable products, bouncy castles, awnings, tents, parachutes, gliders, hot air balloons, sails, banners, lorry curtain sidings, top stitching leather etc., + many other large items..
Electronic servo motor with automatic needle position. Electronically controlled automatic thread trimmer.